This tutorial is intended as a reference for other tutorials on flashbynight.com/tutes which make use of the document class. Rather than cover it in each tutorial, I’ve linked the other tutorials to send them here. OK, what is a document class? Before Actionscript version 3 (AS3), most programmers put their code in the main timeline of the main flash movie. The code would end up on different frames and inside buttons and it was just all a general big mess. Then AS3 came along and forced actionscript programmers to be a bit more disciplined. From now on, we would be encouraged to separate the code from the flash movie in a separate file (sometimes in more than one separate file). The separate files are called classes. The main class that holds our code is called the document class. It runs automatically when we run our flash movie. 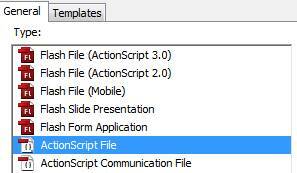 Hence, we will need two files: the .fla and an actionscript file with the .as extension. 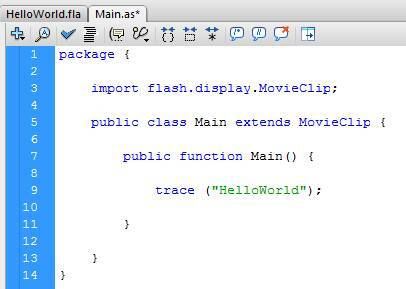 Our example will link the document class to a flash movie and trace the message, “Hello World”. Save the flash file. I’ve chosen the name HelloWorld.fla. Line 1: We need to contain all of our code in a package. We need this line for any external class. Line 3: We need to import the features we will be using. The document class behaves as a MovieClip, so we need this line. Line 5: As we mentioned, the document class behaves as a MovieClip and, in fact, extends the features of a MovieClip. In this line, the name of the class MUST match the name you used when you saved the .as file; capital lettering must match also. Line 7: This function will be called automatically when the movie is played. Again, the name must match, including capitals. Line 9: This is where we run the trace to display “HelloWorld”. Line 13: This line closes the class definition. You can have as many functions as you like within the document, but they must come inside the class definition, currently closed at this line. Keep in mind that the Main() function is the only one that will be called automatically. You can click on the pencil icon to ensure it is linked properly. We’re done, but there is one more important thing to note. 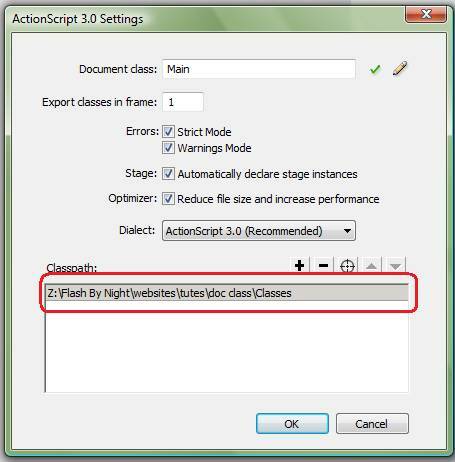 If you wish to keep your document class in a different folder from your Flash movie (a common practice), you need to show the Flash movie where to look for it. This adds one extra step. From here, you can enter the path to your document class, as shown. Click the pencil icon to make sure it works. If you get the following error message, something is wrong. Go back and check that the path is correct. This step can be important; many programmers like to keep all their classes in a central location.